If you have a garage in your home, you know how inconvenient it can be to have to get out of the car to open and close it manually every single time you want to enter or exit. To make it even worse, some garage doors are so bulky that every single time you try to open it, you are taken aback by the amount of effort you have to exert. That is why it is always a good idea to invest in an automatic garage door opener. These machines save you the hassle of having to do all that manual labor, and they also help to enhance security and safety. By far one of the best garage door openers on the market right now is the Chamberlain PD612EV 1/2 HP MyQ Enabled Chain Drive Garage Door Opener. This garage door opener comes with a whole host of impressive security and safety features. Its off white color means that it is aesthetically pleasing and can fit into any color scheme with ease, and the its reliability and ease of installation means that this is a device that you are going to find invaluable for years to come. The Chamberlain PD612EV 1/2 HP MyQ Enabled Chain Drive Garage Door Opener comes with a strong, durable ½ horsepower motor and chain drive that make this one of the highest rated chain driven garage door openers in its class. 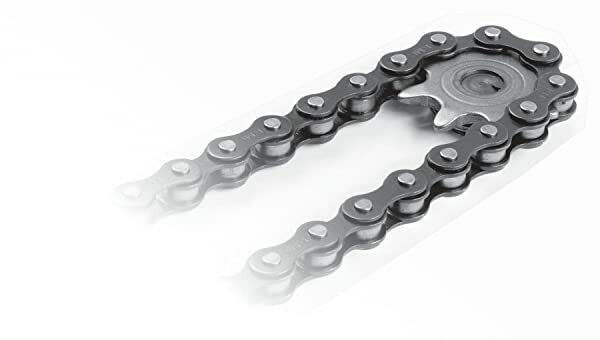 The chain drive provides some of the best performance that any garage door opener has to offer, and for a chain driven unit, the Chamberlain PD612EV runs surprisingly smoothly and quietly. This makes it ideal for those who live in multi-story homes, or for people who have bedrooms or living rooms close to the garage door. The solid steel chassis and rail that control the door are solidly built, guaranteeing durability and long lasting performance. 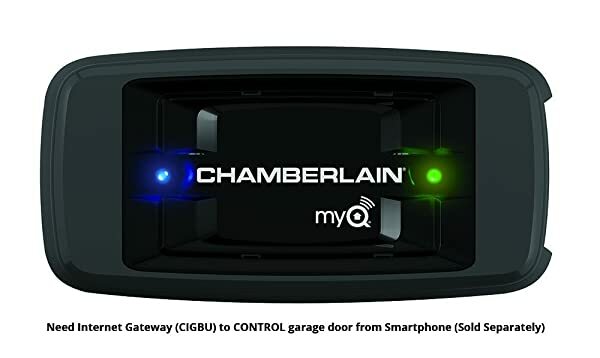 The Chamberlain PD612EV Garage Door Opener comes with Chamberlain’s celebrated MyQ technology which lets you monitor, open, and close your garage door from the palm of your hand using a smart phone or a tablet. The MyQ app is compatible with both Android and iPhone, meaning that you should have no compatibility issues what so ever. If you do not want to download the app, the Chamberlain PD612EV 1/2 HP MyQ Enabled Chain Drive Garage Door Opener comes with two, three button remote controls that will allow you to open and close your garage with the touch of a button. One of the greatest things about these remotes is that the coding for the remote changes every time that you use it, ensuring greater security by reducing the risk of someone hacking your frequency. The Chamberlain PD612EV also comes with a wireless keypad that allows you to access the garage using a unique four-digit code, should you not be able to access your garage using the remotes or your smartphone. The MyQ app also allows you to control the 200 Watt lights that come with the Chamberlain PD612EV, which ensures that you no longer have to worry about stumbling around in the dark when you arrive or have to leave your house at night. The door opener is HomeLink compatible, meaning that if you can use your car’s inbuilt HomeLink application to open and close the door, in addition to the remotes and the MyQ app. As mentioned earlier, this is one of the most highly rated chain driven garage door openers on the market. It’s rating on Amazon is impressive. However, there are a few problems with this unit that you need to know about before you decide to buy the system. To begin with, though the MyQ system is brilliant, before you can begin to take full advantage of it you will need to buy the MyQ gateway. This device costs about $50, and though it is brilliant little device to have to pair with your door opener, and indeed, any other Chamberlain product you may have that is MyQ compatible, the price tag is a little steep, as it is worth about a third of the price of the actual door opener itself. There is also a problem when it comes to compatibility with the HomeLink system. There are some cars that are not compatible with the Chamberlain PD612EV, and therefore cannot link to the system. It is recommended (by the manufacturers themselves) that you check on their website to see if your car is compatible with their system. The Chamberlain PD612EV is designed to be used with 7-foot-high doors, therefore, if you are one of those people that owns an 8-foot-tall door, you are going to have to spend an additional $40 for the 8-foot extension kit. Also when it comes to installation, this may be an easy unit to install but only if you are seasoned at DIY projects. For those of you who are just starting out, the installation of this door opener may prove trickier than you imagine. Also, should you have to replace a part, you are going to have to take down the whole unit, replace the part, and reinstall it if you hope to get the opener working again. There are a few reasons why you should think twice about buying this product. If you are unlucky enough to have to get the 8-foot extension AND the gateway, you could be set back almost $100, in addition to the Currently Not Available* price tag. However, that is honestly a small price to pay for the satisfaction that you will get from this unit. The fact that you can relax knowing that you can monitor all aspects of it from anywhere in the world is also a wonderful thing. All things considered, this is a product that you would be crazy not to consider buying.